And it was certainly a glorious day today on the banks of the Boyne. A welcome change from the persistent rain of Saturday and the torrential showers of Sunday. Very worrying for the coming week. It was a quiet day on site today because of the departure of three of the team at the end of last week. We are expecting some new blood tomorrow all going well and they will be very welcome. Today, the main focus was in Trench 1 on the slope of the gravel terrace on the northern side of the site. Having exposed and recorded the surface of archaeological layers by the end of last week, we now took a closer look at the separate components within this surface (see Day 4 blog). We had to determine which layer we should excavate next. There are two banks in Trench 1 and on either side of these banks there appears to be a layer of larger stones in a position that suggests that they may have slipped downwards off the bank itself. This material is likely to be lying on top of the junction between the ditch (fosse) and bank. The ditch, although visible on the surface as a dip in the ground surface, is not open to its full depth because in the years since it was dug various processes have been at work filling it back in again. Rainwater washes clay and soil downslope from the banks which settles in the low ground of the ditch. Sometimes stones roll down the slope into the ditch as well. Animals walking over and back over the banks wear them down and encourage movement of material into the ditches. Very often when sites were lived in, ditches were used as convenient landfill sites so a lot of food and other waste made its way into them. Thus the soils of ditches are often looser than the soils around them, they often are less stony and often have organic domestic waste in them, including charcoal, which makes them different to the soils of other features around them. While we have identified an area where the material is very likely to be ditch fill, we are currently trying to find the extent of this material, i.e., where are the edges. This is tricky because of the large amount of smaller stones in the soils and also because the soils are so similar in colour. However, we are confident that we will resolve this before long. There are still finds including flint and animal bone coming out of the soil we are digging so we know that it is fill; these materials could not have found their way into undisturbed natural soil. Lots more to be done tomorrow. Hope the rain holds off. Week-End 1: No rest for the wicked! No, I’m not telling you how much washing I had to do after the first week or how long I slept for. In fact, although the team had both days off over the week-end, Kevin and Mark of Landscape & Geophysical Survices came down to the site with me to do some geophysical surveying on Saturday (in spite of the very persistent, and sometimes heavy, rain). There were a number of questions to be followed up on and pieces of work to be done. Firstly, we needed to carry out an electrical resistance tomography (ERT) survey over the line of Trench 4 before it is excavated. This had been done previously along the bank where Trenches 1 and 3 are located. This is a little used but very useful technique because, unlike other more conventional geophysical survey methods like magnetic gradiometry or earth resistance which produce map-like plots, and ERT survey produces a section along a line, so it takes a vertical slice downwards across the line chosen. If you are planning to excavate a series of substantial cut features like ditches, this is an ideal technique as it lets you know exactly where the feature is located and it also gives an indication of its depth. Very useful information if you are trying to budget out how long a job might take. An electrical signal is sent down into the soil which is reflected back upwards. The signal is distorted depending on the depth and the nature of the obstacles encountered. For those of you interested in the technical details of the technique, ERT uses a series of electrodes to pass an electric current into the ground and measure a resulting voltage. Using the values of current and voltage a resistance can be calculated using Ohm’s Law. The depth of penetration of the current is a function of the spacing of the electrodes, the wider the spacing the deeper the current flow. By selectively increasing the electrode separation the resistance of the sediments existing from the ground surface to greater depths can be measured. In order to compensate for the increasing electrode separation each resistance value is multiplied by a factor based on the electrode spacing and it becomes a resistivity. The resistivities are then plotted on a pseudosection which represents the distribution of resistivity with depth. In order to relate the overall resistivity distribution to the individual resistivities of host sediments and possible buried archaeological features such as ditches and walls the resistivity values in pseudosection are subjected to a computer modeling process. This process results in a more realistic model or section of the surface which then can be interpreted in terms of the possible archaeology intersected by the section. 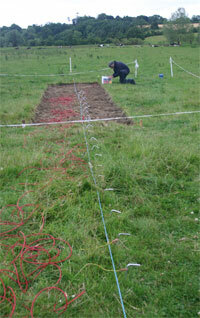 In the case of Trench 4 we are trying to locate the outer ditch seen in the magnetic gradiometry data. The ditch can be seen as a lower resistivity feature about 9m along the section. The lower resistivity represents the fill of the ditch. Underneath the ditch is even lower resistivity and we are wondering if this is due to clays laid down by the River Boyne and/or water saturated sediments. The excavation may reveal the answer to this question. 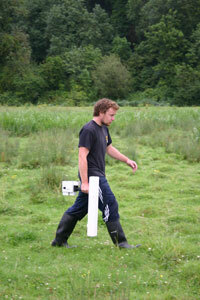 The next job we had to do was to trace the full length of the outer enclosure. Earlier survey work had established that this feature continued from the tillage field into the pasture field to the east (where Trench 4 is located). However, we had yet to fully map its entire length. Mark did this using a magnetic gradiometer, the same kind of instrument that had been used previously. This detects minute distortions in the earth’s magnetic field caused by the properties of the soils close to ground surface. Archaeological features like fireplaces and the fills of pits and ditches often contain soils and materials that will affect the earth’s magnetic field and these very sensitive instruments are capable of detecting these changes. This survey was successful and, although there had been a lot of disturbance of archaeological features by later cultivation, the line of the ditch was detected traveling eastwards to meet the riverbank where we guessed it would. 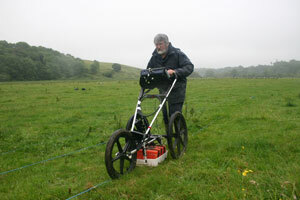 We also took the opportunity to carry out a survey with another technique: ground penetrating radar (GPR). This technique works like an ERT survey. A signal (in this case radar, a type of radio wave) is sent downwards into the ground and is reflected back to the surface by different materials. The nature of the reflected signal received on the surface by the unit can tell about what it is (hard, soft, void) and its depth. Thus a vertical slice, like with ERT, is obtained. However, when a series of parallel lines is surveyed, and the data are downloaded and processed with the appropriate software, we end up with a 3-D model of the sub-surface archaeology of the survey area. We look forward to seeing the results of this one and depending on the success of the survey and the quality of the survey, I’ll give you a look too. Watch this space!